The end of an era, the turning of a page, the fifth and final installment! ... Well, at least for now. The TESO Creatures series will be taking a break but may return eventually. This addition will give a break down of information of two known creatures from previous games - the Dreugh and the Daedroth. Those coming strictly from playing Skyrim may not know much about these monsters, so that's where this article comes in! As always, the links below will provide you with quick access to the previous articles in the series, just in case you missed one. 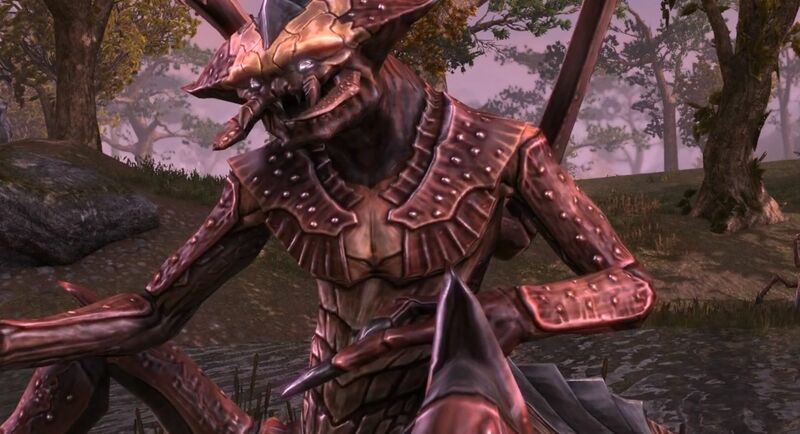 Dreugh have been spotted in Elder Scrolls games as early as Daggerfall, and are one of the very few monsters which stayed true to it's original form. There are of course, minor deviations but the story of progression behind these strange creatures is actually rather interesting. Their are in fact, two types of Dreugh which are worth noting, that only differentiate slightly from each other. The Dreugh seen in it's current game, Oblivion, is resistant to both magicka and any type of normal weaponry. It uses it's tough exterior to it's advantage and can attack by using shock spells or it's dagger-like claws. Previous Games: Strangely, the Dreugh hasn't changed much at all during it's time in each game. It's a sort of multi-legged crab creature with a protective shell and an almost humanoid upper body. In Daggerfall and Morrowind, they were seen in water with the same sort of look about them but with tentacles rather than legs. The only change to take note of is that Dreugh found in Oblivion are actually Land Dreugh, an evolved version of a Water Dreugh which cannot swim. Elder Scrolls Online: We know from the Creating Elder Scrolls Online - The Dreugh video that we will most definitely have land Dreugh to fight that look strikingly similar to the ones found in Oblivion. What we don't know, however, is whether we will see Water Dreugh. Previous Games: In both Daggerfall and Morrowind, the Water Dreugh were obviously found in coastal regions and caverns, flooded with water. 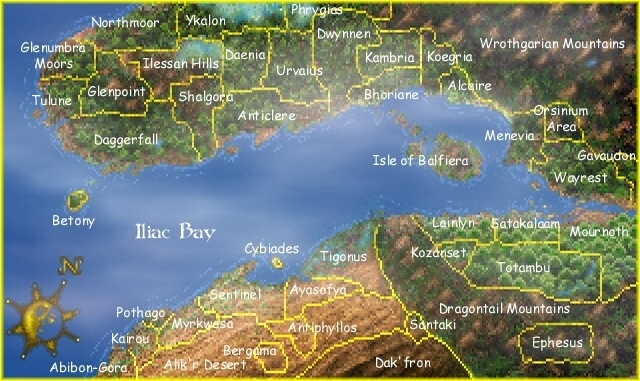 They inhabit the entirety of the The Lilac Bay, which stands as a barrier between High Rock and Hammerfell. In Oblivion, the Dreugh, in the Land form, are only found at Crayfish Cave near Leyawiin. Elder Scrolls Online: It's hard to say exactly where the Dreugh will be located exactly in the Elder Scrolls Online, but we know from the end of the Gameplay video that the Land Dreugh will most definitely be in Morrowind. Since they are not uncommon around the provinces of High Rock and Hammerfell, we may look for them there as well. Obviously it would nice to see some variety with the Dreugh and have both adolescents and adults to battle against. We know there will be two types of Land Dreugh from the pictures released. The two types thus far are the Red Dreugh and the Blue Dreugh. These are not their actual names, but rather placeholders to use for distinction within the article. One is most likely going to be more powerful than the other - possibly the Blue Dreugh - and will be seen in higher-level areas. While this gives us some variation, I still personally stand strong on the opinion that it would be nice to go back to the Daggerfall and Morrowind days. Daedroth are peculiar creatures with a deep Elder Scrolls history much like the Dreugh. They are said to be servants of Molag Bal which may tie them into the main story of the Elder Scrolls Online in some way or another. They are powerhouses with scaly, tough hides and terrifying rows of teeth. With an intensely intimidating size, the Daedroth's speed and power make it a definite threat. Your best bet is to keep the creature at a distance, but even so it's fire breath can deal some serious damage. Previous Games: In Daggerfall, Daedroth were quite literally red-eyed lizard people wearing armor. If you're curious, you can see one here in all it's low-resolution glory. In Morrowind, the Daedroth shed some of it's armor and in Oblivion they lost it entirely in turn for a more animalistic look, though they still stood on two legs. Because Molag Bal favors the more ruthless and savage looking beasts, Daedroth are in accordance with that description. The alligator-like creatures took on a bit more girth in Oblivion which made them seem even more threatening. Elder scrolls Online: Keeping with the theme of Oblivion, the Daedroth in the Elder Scrolls Online are most certainly large in size and tough in appearance. We've also seen a more ultimate version of the Daedroth which is similar in colour to those of its Oblivion counterparts. Previous Games: The Daedroth is found sporadically throughout the caves and ruins of both Morrowind and Oblivion. While they are said to be Daedric servants of Molag Bal, we obviously have not been privy to any first hand experience of them in his realm. Elder Scrolls Online: Since Molag Bal is the main antagonist of the Elder Scrolls Online, we may finally be able to see the Daedroth is his realm. Obviously we'll still see them in Tamriel in their typical places of caves, ruins and possible swampy areas. Obviously, as previously mentioned, I am really vying for the chance to see Daedroth in the realm they are supposed to have been created in. Additionally, it seems as though there will be variants of the Daedroth, with a sort of lesser version and a larger more powerful version used for boss fights or whatnot. It will be interesting to see the challenge level of these creatures, as they are made to look like an unassailable mass of power. My first experiences with both Dreugh and Daedroth came from Morrowind while I was rather young. Brace yourselves, as the last of this series is about to get personal! It was my first play through of the game and I was never exactly the bravest kid in the world. The Dreugh I found rather interesting and my first accidental plunge into the water to meet one was actually rather uneventful. The Daedroth, however, I remember. The details are fuzzy as I was so young, but I remember being attacked with some awful shock spell from behind, only to turn around to a mouth full of teeth. I'm not proud to say it, but I screamed, bringing the attention of my father who I was living with at the time. I then had to explain the whole ordeal to him and he laughed at me. Looking back it's pretty ridiculous, but at the time that 'Alligator' was scary! Do you have any stories about either of these creatures? I'm eager to know! Also, since this is the end of the series, let me know what you thought of it! From my own experiences: The Dreugh- I remember this one, I first saw it in Morrowind when I was going to travel to the island of Solstheim by the Khajiit and the boat,I was so happy that I jumped into the water and that's when I heard combat music playing. At first at that it was a slaughterfish but I turned to see the Dreugh rushing at me. I was so scared, I didn't know what it was I was swimming around screaming trying to find a way up but I couldn't because the docks were above the water. It was hitting me and hitting me, but this was early on in the game, and I had a low short blade skill so out of 6 times of attacking I hit him once. But then I used the 'Walking Walking' and killed him with destruction spells. Daedroth- My first experience from this was a few days ago. I got The Elder Scrolls Anthology for X-mas, but I got sick and I really couldn't get out of bed a a few days then I installed Oblivion and got up to level 18 and was planing to go into a Oblivion gate. But you know when you walk up to one, a leveled daedra is their? Well a Daedroth was their and I, well, I ran away but he killed me with his fire-bolt attack, but it just so happened that I quicksaved RIGHT BEFORE I DIED. My last official save was the day before that, then it took me some time before I saw the save titled "autosave" D: And i saw myself get killed around 10 times. I never saw them in Morrowind though. This was a great article, as usual, and I really enjoyed the series. (January 5th 2014, 10:56 AM)RiDo'Ja Wrote: This was a great article, as usual, and I really enjoyed the series. I have really enjoyed this series thank you.